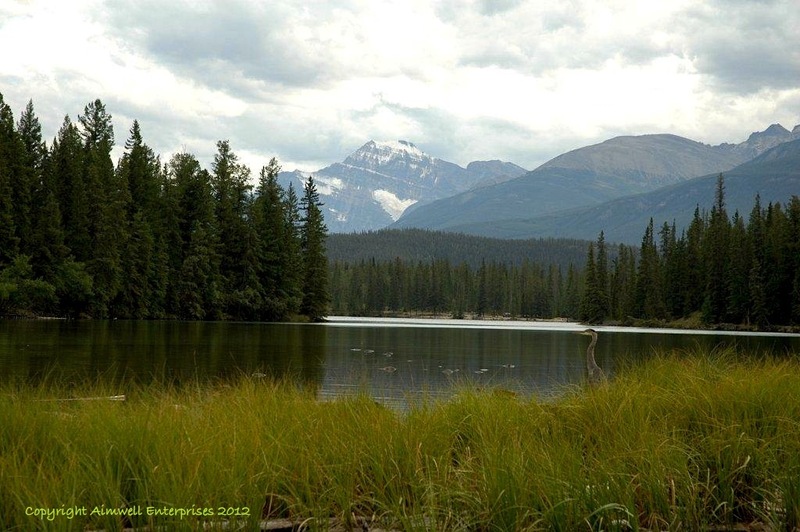 One of my favourite vacation spots is the Alberta Rockies. Whether Banff, Jasper or beyond I’m filled with the joy basking in the magnificence of nature’s skyscrapers can bestow. A couple of years ago in late summer Lloyd and I visited Jasper National Park and stayed over night at the beautiful Fairmont Jasper Park Lodge. During our stay we took the hour-long walk around Lake Mildred upon whose shore sits the Lodge and its scenic golf course. Around every bend of the lake lay a new wonder and in one marshy area we happened upon this heron lost in his own meditation. Rising dramatically in the background is majestic Pyramid Mountain. The heron was difficult to see at first so well blended was he with his habitat, but once we had our sights on him we stopped and observed for a while as he calmly interacted with his environs. Looking at this image reminds me of the serenity of that moment and the singular peace to be found among nature’s mountainous beauty. I’m not sure when I’m going back, but I do hope it’s soon. This entry was posted in Alberta, Landscapes, Musings, Nature, Photography, Reflections, Thoughts, Travel, Uncategorized and tagged Alberta, birds, Jasper, Jasper National Park, Lake Mildred, mountains, Photography, Rocky Mountains, Travel. Bookmark the permalink. Saw this post, and must concur with your thoughts. I am posting a moraine lake shot tomm if you care to stop and look.